1. What do visitors and friends enjoy about coming to stay with you? Everyone loves the big house, lounging on the verandahs, the big fireplaces and long walks into town. We have all had a lot of pleasure visiting places like the Botanical Gardens and the Oak Forest in North Harcourt is a real gem. It is so beautiful and wild out there and is great for mountain bike riding. Everyone enjoys the fact that we have kangaroos in our garden and the bird life is amazing. The sounds of the cockatoos, as they whirl in great flocks across the landscape, are a sound to behold and one of our favorite views is from the verandah as storms swirl in. We have enjoyed many natural light shows from our front verandah. 2. What has given you most pleasure living here? It was a complete bonus that such a big house with an acre was considerably more affordable than an equivalent in Melbourne. We had lived in contemporary homes in places like Williamstown and were happy to come to this part of Victoria where the children could have so much more freedom. We had looked elsewhere but were drawn by the fact that so many creative colleagues lived here. We love the fact that it is a working town and not simply a tourist destination. It has also suited us that we have never felt as though we abandoned city life. Melbourne is very accessible and we have fully benefited from the fast train service. Above all we have savored the fact that our children could walk to school and home from school without any fuss. The primary schools have been fabulous and offer personalized attention. We are going back to the United Kingdom and will miss many aspects of living in this amazing place. 3. 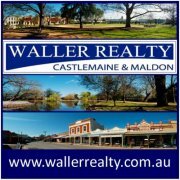 Castlemaine and Maldon have a rich history that harks back to the gold rushes of the 1800s. You’ll love waking up here every day to country sounds. You’ll feel part of the rich tapestry of the past that can be experienced in this region.